In 1955, when the founding fathers of the Non-Aligned Movement (N.A.M.) held their first meeting in the now-famous Bandung Gathering, the role of the N.A.M. seemed clear: prevention of a new war. In a world already savagely ravaged by the Second World War, the U.S.S.R. and the United States embarked on a new kind of military and political confrontation: Cold War. So the role and the place of a non-aligned movement were clear and easy to carve—keeping the two opposing blocs in equilibrium and preventing the Cold War from becoming a nuclear war. After the fall of communism and dissolution of the Warsaw Pact in 1991, the N.A.M. seemed to be out of place in a world that promised to be without military or ideological confrontation. Many foresaw an end to the organization in a post-Cold War world. But after the U.S. invasions of Afghanistan and Iraq presented the risk of a unipolar world, the N.A.M. now has a new chance to play a historic role, namely in the search for a multipolar world. We are seeing an increase in relevance of the so-called Bandung spirit. In 1955 at its inaugural session, the five key figures of the movement—Josif Broz Tito of Yugoslavia, Jawaharlal Nehru of India, Gamel Nasser of Egypt, Sukarno of Indonesia and Kwame Nkrumah of Ghana—wanted this new organization to stand for non-aggression, non-interference, respect for independence, equality and peaceful co-existence. At the end of the Cold War this principle seemed to stay at the heart of the new international security structure. The dissolution of the U.S.S.R. granted freedom to the people in the communist region, and the Kuwait War (1991) signaled a new role of the United Nations as a protector of small countries' independence. This long-developed dream was dashed, not only by the U.S.-led invasion of Afghanistan (2001) and the unilateral Iraq invasion (2003), but also by the threats surrounding North Korea. Add to this the orange revolution in Eastern Europe, and the international climate was clearly changing. In this new confrontational era, the spirit of Bandung was the key for re-establishing order in the world. In an unexpected way, the so-called War on Terror marked the necessity for a balanced world in which no power could act without impunity—the necessity that marked the renaissance of the Non Aligned Movement. Is the N.A.M. a power? At first glance the answer appears to be a clear yes. With 118 member states and another 15 observer states waiting for admittance—comprising almost 55 percent of the world population and 20 percent of world economy—demographic and economic data suggest an important power within this movement. The days when the Movement looked as if it would lose its meaning appear to be over. But on a realistic note, the N.A.M. still has the same weakness that crippled its influence on the Cold War period. The Bandung five fathers imagined a powerful military, political and economical alliance that could balance the United States and Soviet Union. This strong alliance is not yet built. Politically, the connections between these countries are still week. Economically also, there is no plan for common development, no trade agreement or economic project to hold together the N.A.M. members. Also, the N.A.M. does not offer a political mechanism for dismantling inner tension between member states and no military common capacity to give solidarity to the movement. State-by-state agreement does not substitute for a common unified mechanism. The N.A.M. also lacks the material resources to put forward a common international agenda. A weak point of the Movement is the dependency on the country that is chairing the N.A.M. Alliance. The last three years are a perfect example of this, with the Cuban presidency of N.A.M. from 2006 to 2009. The years of Cuban mandate marked a bust in international visibility, while the Egyptian mandate succeeded only in putting the organization into shadow. The N.A.M. has a lot of work to do to measure up with NATO or United States influence. Is the N.A.M. rising up? Despite these internal issues, the Cuban presidency and the N.A.M. have introduced a few initiatives that could foster the image and influence of the organization. The most important was the decision to get involved in long-postponed, but necessary, reform of the United Nations system. Taking part in common peacekeeping operations offers a breeding ground for an experimental military task force of the N.A.M. Also, the Committee on Palestine of N.A.M. has offered credible solution to the Middle East problem, requesting Israel to to halt its settlement activities, open up border crossings, cease the use of force and violence against civilians, and relinquish Gaza and West Bank territories to a future Palestinian state. Extremely important was the decision by the N.A.M. to emphasize justice and respect for fundamental human rights, and to emphasize the principles of the Charter of the United Nations, thereby relinquishing its former reputation as the club of autocrats and fostering democracy of the member states. Of course, it is still a long way until the N.A.M. will be a club of democracy, but it is a step in the right direction. These new stances—the decision to create a joint economic cooperation committee and to offer a new leadership to the organization in the form of a Joint Coordinating Committee that doubles the state leadership of the N.A.M.—are opportunities to make the organization more efficient and more visible. The Non Aligned Movement, after playing a part in the Cold War adventure, now has a new calling: fostering a new power for a multipolar world. The last decade, dominated by a sole superpower, was not a beneficial one, as it saw increase in military spending, economic crisis, wars in Afghanistan and Iraq, and destabilizing of the Middle East region. 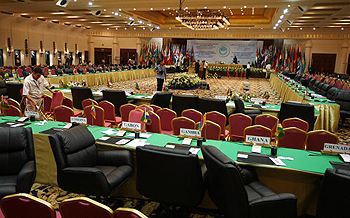 These matters and others need to be addressed by the re-emergence of the Non Aligned Movement.